Rather than being a catalyst for positive change, the European Games have become a weapon in Baku’s effort to promote itself as progressive while continuing to crush independent voices. 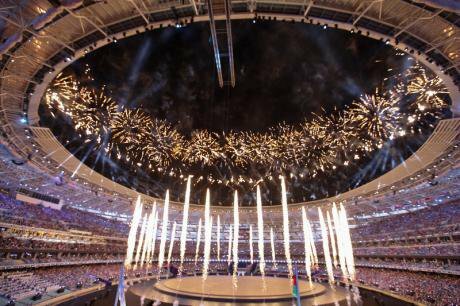 The recent FIFA corruption scandal is not the only major crisis gripping international sport this summer: the inaugural European Games opened on June 12 in Azerbaijan, one of the most repressive countries in Europe. With a troubling rights record over many years, the Azerbaijani government has upped its oppression in the last year to silence domestic journalists, human rights defenders, opposition activists and other critics ahead of the games. Rather than being a catalyst for positive change, as many in the international sporting community had hoped, the first European Games have become yet another weapon in the Azerbaijani government’s effort to promote itself as a progressive, modern country—all the while carrying out a domestic assault on those who challenge the government’s version of truth. The European Games, held in Azerbaijan’s capital, Baku, are a multi-sport event for more than 6,000 athletes from 50 European nations. Founded in 2012, the games are meant to be a European equivalent of the Pan-Asian and Pan-American Games. The games are owned and regulated by the European Olympic Committees (EOC), an association of 50 European National Olympic Committees. The official opening ceremony of the European Games in Baku. Photo (c) Aziz Karimov via DemotixThe EOC and its members are part of the Olympic Movement and they are governed by the Olympic Charter, which has explicit guarantees of media freedom, and calls for sport to promote ‘human dignity’ and ‘the harmonious development of humankind.’ But you would hardly believe that those are the guiding principles of these games, given the government’s abuses in the run-up, while it has paid little, if any, price for those actions. Meanwhile, the EOC has largely turned a blind eye to the repression, and in doing so has failed to uphold the Olympic Charter. It has squandered a rare opportunity to press for meaningful, lasting change and the positive legacy sporting events should bring. Instead, Azerbaijan is more entrenched in repressive ways than ever. Most host countries of major sporting events spend the year leading up to the event finalizing sports venues, communications networks and the immense infrastructure required of hosts. Yet the Azerbaijani government had an additional agenda in the run up to the games: to crush independent voices. Since June 2014, the government has lashed out at the best-known and most-well-respected rights advocates and journalists, with arrests, bogus criminal charges, long imprisonments, smear campaigns, threats against family members, and alleged violence and inhuman treatment in detention. The Azerbaijani government had an additional agenda in the run up to the games: to crush independent voices. Other activists and journalists have fled their homeland for unknown fates abroad, understandably fearing the same consequences for their criticism of the government if they stayed put. Authorities also closed dozens of independent groups working on topics ranging from human rights to corruption to labour protections. Last July, the authorities arrested Leyla Yunus, director of the Institute for Peace and Democracy, an organization that has focused on combating politically motivated prosecutions, corruption, violence against women, and unlawful evictions. They arrested her husband, Arif Yunus, a well-known historian, a few days later and brought inconceivable charges of treason, tax evasion, and illegal entrepreneurship against the elderly couple. Leyla Yunus suffers from severe health problems, yet the authorities refuse to a hospitalize her or even guarantee her a special diet and regular medicine. In December, the authorities arrested Azerbaijan’s best-known investigative journalist, Khadija Ismailova, who long sought to expose alleged financial wrongdoing and corruption among senior officials. The founder of the Sport for Rights campaign, Rasul Jafarov, was arrested ahead of the games and sentenced to six and a half years in prison. Intigam Aliyev, the country’s most prominent human rights lawyer, was also arrested and sentenced to seven and a half years. The list of those in detention and facing similar prison sentences goes on. Among the groups targeted is the Institute for Reporters’ Freedom and Safety (IRFS), a leading independent media monitoring organisation. Last August, the authorities raided IRFS’s office, interrogated staff, confiscated computers, and sealed the office shut. Fearing arrest, the IRFS director, Emin Huseynov, sought refuge in the Swiss Embassy in Baku, where he remained in limbo for nearly a year. It came as a complete surprise that the government allowed him to leave for Switzerland, escorted by a top Swiss diplomat, the day after the games opened. Huseynov’s brother, also an activist and journalist, remains in Azerbaijan and subject to a travel ban, perhaps as a guarantee that Emin won’t take up activism abroad. Even positive steps by the government nevertheless seem always to be tainted by menace. Internationally, the Azerbaijani government has spared no effort or expense to present a glossy image of an affluent, progressive country on the rise and a worthy host of mega-sporting events. Not wanting to expose its brutal practices and undermine the false image it projects abroad, the government has selectively denied entry to or kicked out several journalists and international monitors and organisations. In the weeks running up to the games, the Azerbaijani government denied accreditation to at least four journalists from major European outlets, including from the chief sports correspondent for the British newspaper The Guardian, and journalists from Radio France Internationale and ARD TV in Germany. Authorities deported another journalist and long-time Azerbaijan critic, Emma Hughes, from the airport, even though she had official accreditation to report on the European Games. The Azerbaijani government has flagrantly contradicted requirements as host country of the European Games to ensure press freedom. Yet the European Olympic Committees have equally failed to enforce the Olympic Charter and require the government reverse these actions. And it’s not just journalists the government wants to keep out. On March 31, border police barred Human Rights Watch’s senior researcher on Azerbaijan, Giorgi Gogia, from entering the country when he arrived at the airport, and deported him without explanation. It was the first time the government had ever barred entry to a Human Rights Watch staff member. In May the Foreign Ministry without explanation failed to respond to a visa request for a Human Rights Watch senior staff member who had been invited by the Asian Development Bank to participate in the bank’s annual meeting in Baku. 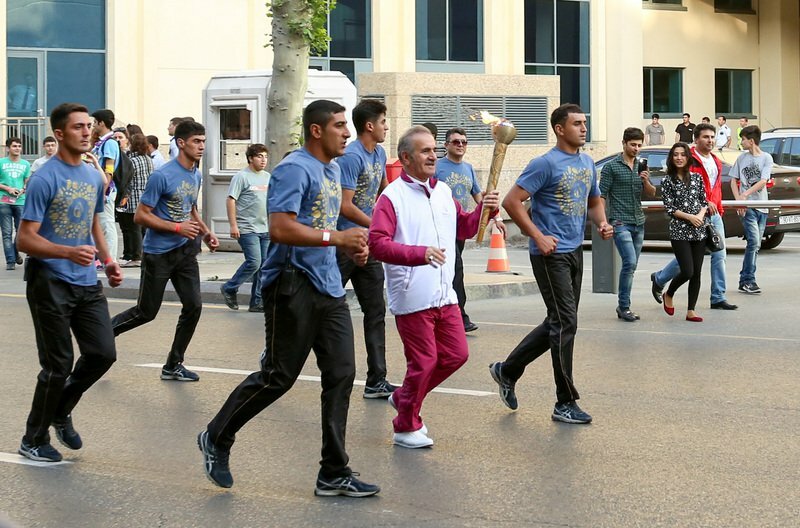 The European Games torch arrives in Baku. June 7. Photo (c) Aziz Karimov via demotixDays before the Games started, the authorities stopped Amnesty International from releasing a report in Baku. And on the eve of the games, the government announced it was closing the Baku office of the inter-governmental Organisation for Security and Cooperation in Europe (OSCE), in which Azerbaijan is a participating state. The local office had led programmes in Azerbaijan combatting terrorism and human trafficking, and promoting good governance, gender equality, and nondiscrimination. The Azerbaijani government has flagrantly contradicted requirements as host country of the European Games to ensure press freedom. Perhaps because of this rights debacle, Western European leaders uniformly declined to attend the European Games opening ceremonies—no doubt much to the disappointment of both the EOC and Azerbaijan President Ilham Aliyev, given the potential the ceremonies have to help legitimate and normalise the image of an abusive government. The most prominent world leader to attend was President Vladimir Putin of Russia. There is just a short window left for the EOC and European governments to use the games, and the positive legacy they are supposed to leave behind, as an opportunity to insist on meaningful positive steps on human rights from the Azerbaijani government. Those steps should include the unconditional release of unjustly held journalists, activists and others. If not, the dreadful legacy of the European Games may be sealed forever. The only bidder for the 2019 games, the Netherlands, has withdrawn.